Layne, our female protagonist of Spark, is also an incredible heroine. She is intelligent, strong, and beautiful without trying to be. I think overall, Layne is much more likable character than Becca is, simply because she's the goody-two-shoes while Becca is feistier. Still, I really liked both girls and I could understand Layne's tortured past and home life just as well as I could Gabriel's. Yet, their romance never won me over. For one, it was the extremely overdone and typically clichéd bad-boy-falls-for-geek-math-tutor story line. While I didn't mind this too much, what I did mind was that I couldn't really feel for these two. I loved them as individual characters and I think their interactions together were sweet and they obviously understand one another very well, but I wasn't invested in their relationship at all. Plus, Layne isn't the type of girl I think anyone would expect Gabriel to fall for and unfortunately, Kemmerer was unable to really make me hop on their boat. I think compared to the sweet romance between Chris and Becca, I have to admit I was a tiny bit disappointed with the love story in this one. What really made me dislike Spark though, was the lack of character development. Gabriel is hot-headed and he's constantly just a giant, raging mess of angst. Seriously, he slams doors, he runs ten miles, he yells, he punches people, and he fights back. It's always constant angst, and while I understood it, after awhile it began to become annoying. Gabriel goes through a lot of experiences in this novel, especially with his brothers, and I wanted him to learn from them and become a better person who wasn't constantly fueled by his emotions, but even at the end, I just don't think he was. Yes, he gained mastery over his powers, but what about over himself? I still feel as if Gabriel could have grown and developed a little more in this one and the fact that I didn't see that as much as I would have liked was upsetting. Ooooh, Keertana, I'm so sorry this didn't work out for you! I *DO* love Spark, but I can totally understand what you mean. At least it wasn't THAT bad. I couldn't finish Storm but I loved Gabriel so much in the first book that I'm willing to give it another try just so I could read Spark. 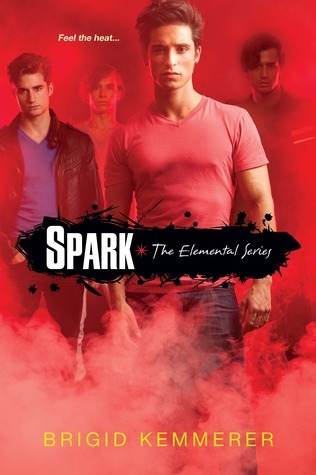 Or maybe I'll just read Spark...and I hope I'd find this better than Storm. I am just annoyed that I haven't gotten to this series yet, I keep hearing about these brothers. I am okay with lack of action as long as there are good characters and a solid story. It seems that YA more often than not has unreleastic parents, right? I am sorry I am not as good about getting round to blogs right now, but Something Wicked is keeping me extraordianryly busy. Thanks for stopping by! Aw, I'm sorry this was lacking for you! I get where you're coming from and the romance wasn't on ~fire~ for me but it was cute enough. Also lol I feel you on being the black sheep, I feel like I am hatin' on everyone's favourite books lately eesh. Awwww, I'm sorry you didn't love Spark as much as Storm, Keertana! While I loved Storm, I actually loved Spark even more than the first book. However, I do agree that reading Spark made me miss Storm too! I have heard good things about this series. I think all the drama and angst that Gabriel exudes would get to me a bit. But I'm definitely eager to give the first book a read! I'm so surprised after everything I've heard about these novels that it had a lack of action! I kept thinking it was almost nothing but action. I'm also sorry to hear about the lack of character development. Still, you liked it and want to read the next. Okay, got me curious! I need to start reading this series. Awwww I'm sorry you weren't feeling Gabriel and Layne Keertana! I absolutely fell in love with Gabriel, but he's definitely not for everyone. Definitely looking forward to Spirit though, this is such a fun series! I was disappointed with this one too! It just wasn't as good as Storm. I can't wait for Spirit though. Samee! I'm nearly always the black sheep, so I hate being that "hater" but what can you do, right?